Feasts and Fasts – A History of Food in India is Chicago-based food historian Colleen Taylor Sen’s most recent culinary outing. 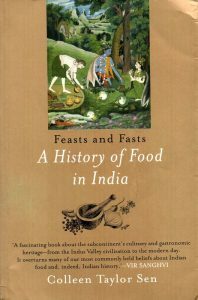 An ambitious effort at exploring the history of Indian gastronomy, the fascinating journey of which, this richly illustrated single volume traces from the Indus Valley Civilization to its present incarnation. It is served as a detailed introduction to the dietary evolution of a diverse sub continental people since prehistoric times, with generous dollops of myriad influences that have accorded it the status of a much-preferred world cuisine today. The author peels away, chapter by chapter, how faith, climate, geography, foreign rule, among others, shaped our culinary heritage and modern day food habits. The opening section helps demystify the effects of physical features, environment, landscape and climate on food patterns since antediluvian ages. The ones after walk the reader through the prevalence of Indo-Aryan customs during the Age of Ritual (1700-1100BCE), and how Vedic Indians of the sixteen mahajanpadas effected the Renunciation Tradition and Vegetarianism (1000 to 300 BCE). Later, orthodoxy and newer religious movements would sway culinary customs to a large extent and Puranic thought would come to prevail till the 10th century CE. Nearly concurrent, or at least from 600BCE to 600CE, the author has us know, doctors were an essential ingredient in nutritional trends of the time. Much of our knowledge about food in ancient India is rooted in medical texts. Culinary customs in the Middle Ages took on a more sophisticated flavour, largely due to the patronage of local and regional dynasties that ruled the sub-continent. This period also saw the mushrooming of food writing as rulers were wont to show off their knowledge by authoring books on various topics. 12th century Chalukya king, Someswara III is credited with writing Manasolassa, a non-religious, non-medical culinary text in Sanskrit; a first. Wherein he describes many dishes which still exist in southern India and some that are rarely imbibed–blood-filled sausages, grilled stomach membrane and barbecued river rats! Others of the ilk included the Supa Shastra and Ksemakutuhalam. Food as we know it, particularly in the north, is replete with Central Asian flourishes, and Sen justifiably devotes a chapter to the Mughals and how they inspired the delectable cuisines of Awadh, Hyderabad, and Kashmir. The halwas, samosas, biryanis and pulaos we relish today are all part of this legacy. Then along came the Europeans bearing tomatoes, potatoes and chillies; rice in any case had arrived many centuries ago from China to become the staple of a large part of the sub-continent. By the time the British departed in 1947, a distinct Anglo-Indian cuisine had found a firm place on the Indian dining table. The section on regional cuisine is a rush-through job about the foods of different Indian states and frankly leaves much to be desired. of years the people of the land went to China and Southeast Asia, the Middle East, Central Asia and North Africa is no revelation. It was the departure of indentured labour from Bihar and Uttar Pradesh in the 19th century that eventually fuelled culinary trends in the Caribbean, Mauritius, Fiji, South, East and Portuguese Africa. Around the same time Tamil workers from South India and Sri Lanka were ferried to Singapore and Malaysia. The presence of Indian cuisine in Britain, North America and the Gulf though is a consequence of later migrations. Despite the unfamiliarity with classical Indian languages, the author’s scholarship on the subject becomes evident from her ability to harvest pertinent information from sources as varied as Manu, Hieun Tsang, and early cookbooks like the Lokopakara and Ni’matnama. Sen spices up her conversational narrative with colourful images and maps, easy to follow recipes, and legendary gourmands (Nawab Wajid Ali Shah, for one). She garnishes further with quirky anecdotes and ancient poems centred on cuisine, including an Agni-appeasing ode to ghee from the Rig Veda. These work as welcome palate cleansers when the read turns a tad protracted every now and then. Experienced observers are also likely to bite into unpalatable textual and editing anomalies in an otherwise well-researched and passionate work. Nonetheless, this hotpot wafts up many an amuse bouche for the leisure reader, as much as it does a wholesome repast for scholarly rumination.